Bay Cove was established in 1974 as a single program dedicated to medically-supervised detoxification of individuals struggling with drug and alcohol addiction. However, the founders of the agency quickly came to the determination that they could do much more, and help many more people struggling with any number of significant life challenges. Today, Bay Cove operates more than 170 programs, providing a tremendously diverse range of services to an even more diverse audience of men, women, and children. Substance use disorder is a medical condition that ravages and derails the lives of people with the disease and their families. Bay Cove provides a continuum of services which offer effective treatments individually tailored to each person, including acute detoxification treatment; inpatient transitional support services; recovery homes for men and women; a shelter for homeless adults struggling with active addiction; and outpatient medication-assisted treatment. Wherever an individual is in his or her battle with addiction, our services are designed to support his or her developing recovery skills and journey to improved health and life. Adult Day Health programs provide supports that enable participants to receive individualized health, wellness, and social services designed to help them remain in their home and community and live as independently as possible. A team of professionals that includes nurses, social workers, activities coordinators, and program assistants lead group therapeutic and social activities, and provide medical monitoring and restorative care to participants--including those with memory loss and dementia--in a safe and comfortable setting. Bay Cove’s Child & Family Services promote the physical, mental and emotional development of children. The Early Intervention (EI) program serves children under three years of age who are developmentally delayed, have a known disabling condition, or who are at risk of developmental delays due to biological or environmental factors. Our Small Wonders Nursery School serves children from 16-36 months of age and provides exceptional early childhood education for children with and without disabilities. Our Homeless Services provide vital specialized resources for members of Metro Boston’s vulnerable homeless community. These resources include proactive intervention programs for individuals with behavioral health issues, in an attempt to prevent homelessness before it starts; a homeless street outreach team; daytime and overnight shelters for specialized sections of the homeless populations, including one of the area’s only shelters for individuals dealing with active substance use disorders; and transitional housing programs. Bay Cove’s Long Term Support Services (LTSS) offer a variety of ongoing support to individuals with intellectual and developmental disabilities and their families--services that foster each person’s independence, wellness, and full participation in all aspects of life. These services run the gamut from family supports, which help identify and address the unique challenges faced in keeping a disabled family member in the family home; to individual supports for people with disabilities living independently in their community; to supervised residences and day programs that promote the development of skills geared toward helping individuals achieve greater autonomy. Our comprehensive array of Mental Health Services are designed to help people with serious mental illness build fuller and richer lives. 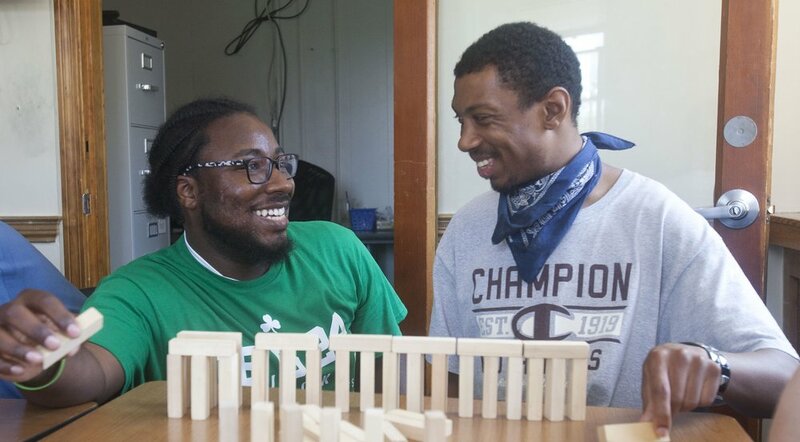 We work with each person to engage them in accessing meaningful connections with others, as well as employment, treatment, crisis services, housing, and rehabilitative opportunities that enhance their stability, wellness and personal recovery. Our services include emergency psychiatric evaluations and diversionary services, specialized residential services, clubhouse, and peer-led recovery supports and care management that promotes improved integration of psychiatric and primary care. Questions about accessing our services?